A site on the western bank of the Nile River; 65 kilometers south of Cairo. A step Mastaba and a royal cemetery were constructed there from the transitional years of the third to fourth dynasty.An unusual early pyramid complex and associated private cemetery, situated close to the Fayoum region. The pyramid is usually ascribed to Huni (2637-2613 BC. ), last king of the third dynasty, although his name doesn’t appear anywhere on the monument and it is perhaps more likely that his funerary monument would have been located at Saqqara (possibly in an unexcavated enclosure to the west of the step pyramids of Djoser &Sekhmkhet ). The medium pyramid may have belonged to his son Snefru, whose name is mentioned in graffiti dating to the New Kingdom (1550-1069 BC.) in the passage and chamber of a small mortuary temple at the site. Alternatively it may have been completed Snefru but begin by Huni, since Snefru himself appears to have had two pyramid complexes at Dahshur. The step mastaba is the last royal tomb that was built in steps ( begun with seven steps and enlarged to eight). With base length of 120.75 meters (365 feet), a height of 85 meters ( 256 feet). And a slope of 75 degrees. The entrance is located 16 meters ( 50 feet ) high on the north side and slopes to the crypt built on ground level. The modern appearance of the medium pyramid is that of a stepped tower, but it was originally constructed as a seven-stepped pyramid, mended to eight steps, and finally provided with a smooth outer casing to transform it into the earliest true pyramid It was once suggested that the outer casing of the Medium pyramid collapsed early in the 4th dynasty, and thus inspired the change of angle in the final stages of Snefru’s ‘bent ‘ pyramid at Dahshur , assuming that both were being built simultaneously. However, the presence of a well-established cemetery of early 4th dynasty Mastaba tombs surrounding the pyramid, as well as the New kingdom graffiti in the mortuary temple, all make it more likely that the collapse came much later, and certainly no earlier than the New Kingdom . The corbelled burial chamber was built into the superstructure of the pyramid at the level of the old ground surface, and, in its architectural sophistication, it is regarded as second only to the ‘grand gallery’ in the Great Pyramid of Khufu at Giza. The building interpreted as a mortuary temple on the east side of the pyramid was found to incorporate two enormous uninscribed round-topped stone stela probably forming part of an offering chaple. An open causeway led to the valley temple, which has not yet been excavated. To the north and the south of the pyramid were ruins of smaller subsidiary pyramids of unknown function. Important remains of construction ramps have been observed there. 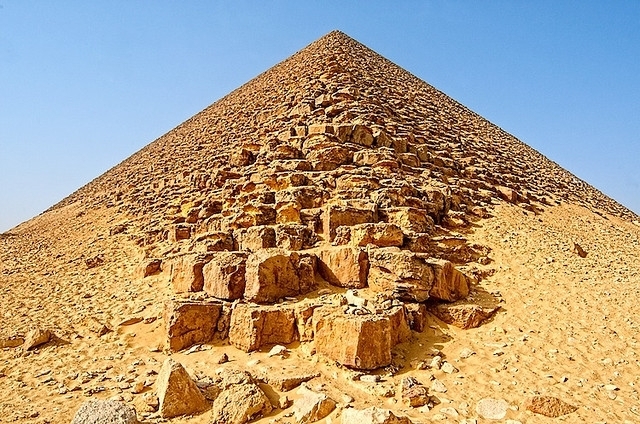 A theory about an alleged collapse of the pyramid casing during the construction created much scholarly confusion, but it has been proven wrong. Mastaba no. 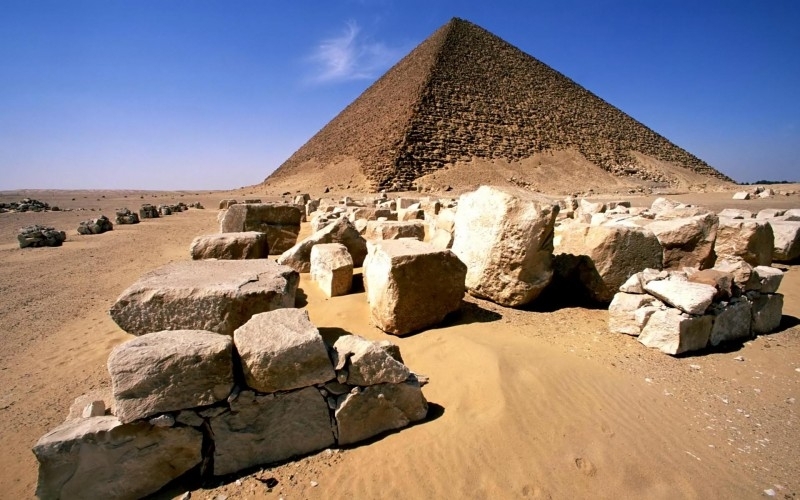 17 northeast of the pyramid, is the majestic tomb for an important member of the royal family. The huge building 52 by 105 meters ( 165 by 330 feet ) is constructed of rough field stones with a wide cult place at the southern end of the eastern side ( 13.5 meters / 32 feet ), now destroyed. The spectacular, stone-cased crypt contains a granite sarcophagus that is 5 meters (16 feet) high. A mastaba field to the north of the pyramid consists of a dozen brick mastabas of the early fourth dynasty. Of great importance for the development of tomb architecture is the mastaba of Nefermaat and Atet ( no9. 16 ). Two offering niches are built into the brick core and cased with limestone; they were decorated with the first line decorations of subjects from everyday life. The decoration of the door frames was executed with incised figures that were filled in with colored pastes. The façade displays a rich panel pattern. The mastaba f prince Rahotep and princess Nofret ( no.6 ) contained a pair of painted, life-size seated figures of the couple, in a unique state of preservation, masterpieces of Old Kingdom sculpture. Excavations at the site were originally by W.M. Filnders Petrie in 1891 and 1909; Alan Rowe 9 Eckley B. Coxe Expedition) in 1929-1930; and the Egyptian Antiquities Organization. 1.Donald B. Redford, Oxford Encyclopedia of Ancient Egypt, Vol.1, Oxford University Press, Inc., Berlin, 2001. 2.Ian Shaw and Paul Nicholson, The British Museum Dictionary Of Ancient Egypt, The American University in Cairo, 2002.